“Transport development is Bulgaria’s priority on Council Presidency and we will foster the development of sustainable transport, including railways. Future investments on railway network across Europe should remain the transport priority for all Member States, since they are financed under Cohesion Fund, CEF – the major sources for transport projects’ implementation. Bulgaria relies heavily on this financial support for railways as the needed investment is huge. The challenges envisage the cross-border connections and for us is essential to implement TEN-T projects as well as infrastructure development to the East, by having efficient transport links with Western Balkans,” Velik Zanchev, Deputy Minister of Transport, Information Technology and Communications – Bulgaria, during a seminar organised by the Bulgarian Presidency of the Council of the EU together with the support of UNIFE. During the Bulgarian Presidency of the Council, between 1 January and 30 June 2018, the connectivity between Western Balkans and with the member states is among country’s priorities. The ambition of the Bulgarian Presidency is to achieve a clear action plan with each of the countries, without creating unrealistic expectations, but with concrete steps. The goal includes the provision of transport connectivity to the Western Balkan countries. Presidency will work to provide more geopolitical and economic support for the Western Balkans through improving their road, railway, air, digital, educational and energy connectivity to the EU. Regarding to Bulgaria’s railway projects, within the Operational Programme “Transport and Transport Infrastructure 2014 – 2020, the country is carrying out Plovdiv-Burgas modernisation (second phase), with a value of EUR 409 million, the Sofia-Septemvri line with Elin Pelin-Ihtiman and Ihtiman-Septemvri as subsections, the modernisation of railway section between Elin Pelin and Kostenets, the construction of Sofia’s metro Line 3. Also, Bulgaria is implementing rail transport projects under different Priority axes such as Priority axis 1 “Development of railway infrastructure along the “core” Trans-European Transport Network”, Priority axis 3 “Improvement of intermodal transport services for passengers and freights and development of sustainable urban transport”. Bulgaria’s railway network has a length of 5,658 km, including current railway – 4,070 km and station tracks–1,588 km. According to Jean-Louis Colson, the Head of the ‘Transport Networks’ Unit, DG MOVE, for Bulgaria, 98 percent of CEF funding goes to railway projects: from the EUR 405.8 million transport financing, EUR 373.6 million are provided for railway transport. All the railway projects included are part of the Orient/East-Med Corridor: Sofia-Voluyak line, Sofia-Elin Pelin, Kostenets–Septemvri, as well as Plovdiv transport Node. 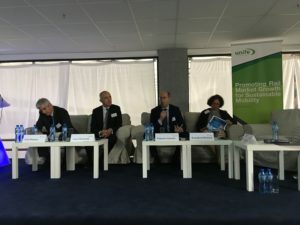 “Bulgaria is intensively uses CEF funds in railway transport and it is in a good connection with the other European funds,” Jean-Louis Colson said.